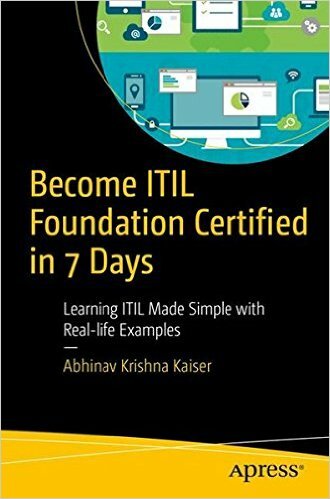 I had given you a heads-up three months back that my book Become ITIL Foundation Certified in 7 Days has entered into production stages. I am now happy to announce that it has been published, thanks to Apress from Springer Corporation for publishing it. Pass the ITIL Foundation examination by learning the basics of ITIL and working through real-life examples. This book breaks the course down for studying in 7 days with 3 hours a day, which means at the end of a week you are ready to pass the exam. You’ll also see tips and an array of sample questions, as well as FAQs on ITIL. All this will prepare you for the examination and give you the knowledge required to pass with flying colors. After using Become ITIL Foundation Certified in 7 Days and earning the ITIL Foundation certification, you’ll be well placed to get the career you always wanted. I started working on the book in August 2015, and was originally planned to complete it before May 2016. However, due to my official consulting engagements, the book development inevitably got delayed by about six months. However, the production team involving graphic artists, copy editors, production editors and the production manager worked long hours to ensure that the book saw the light in 2016. It was released on 30th of December, 2016 on Amazon and other online channels. You can read a sample of the book (about 72 pages out of 255) on Google Books. I haven’t started writing a new book yet, my colleagues are pressing me to write on on DevOps, my latest crush. Let’s see where I go with this idea. Personally, I want to write fiction – with absolutely no experience, it feels like I am going to lose balance every time I get started.